Cloud-Dienste: cloud services, with examples listed such as Google Drive, Apple’s iCloud and Dropbox. Turns out they’re not so popular there. A recent Eurostat study put Germany squarely in the middle of the pack of European countries when it comes to their use. While you would expect Germany to be somewhat ahead of the IT-laggards that study identified, such as Poland and Rumania (8 percent of population uses cloud services), it’s strange that country is not nearer the head of the class along with Denmark (44 percent) or Norway (43 percent). It’s always handy to remember that a healthy chunk of the current German population, somewhere around under a quarter of it, had some experience of living in the old DDR or East Germany, with its intrusive Stasi secret police. Germany is also constantly at the forefront of efforts within the EU to shore up individual privacy protections. It also has been leading in its agitation resulting from the Snowden revelations of the wide reach into Europe of the American NSA and British GCHQ, especially after reports emerged that Chancellor Merkel’s own mobile telephone had long been tapped. 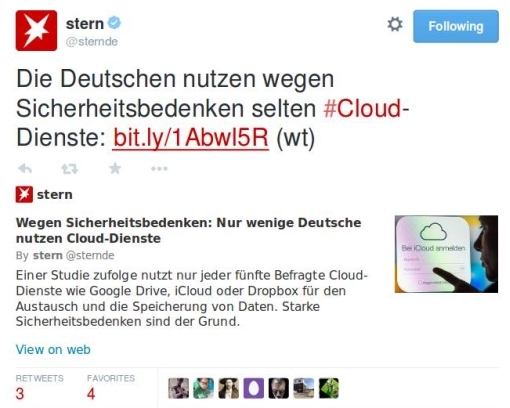 And what do we also find in common concerning those named cloud-data services that Germans are so loathe to take up? That’s right, they are American, run from America and therefore as we know subject to secret demands from the American authorities to give up their secrets, violate their customers’ confidentiality, whenever those US authorities deem that they need to do so. The Stern article is too polite to mention the US, as is the lengthier Bitkom piece (where you can see the full table of country results). But it is clear the fears on the part of US high-tech concerns that their overseas market-share will suffer because of a loss of confidence brought about by the ruthless worldwide surveillance from the Anglo-Saxon authorities are by no means unfounded. The big contemporary story now on the civil liberties front is that of the recent revelations made via the Guardian and the Washington Post about the extensive program of US Government spying, on its own citizens and those abroad, and with the cooperation of most Internet institutions such as Google, Yahoo and Facebook. An up-and-coming related issue is the anger against US authorities coming from foreign governments and institutions – such as the EU – whose citizens are being spied upon in this way. Some press reaction has been “Nothing-to-see-here-folks.” (A terrible piece, but I feel it merits being pushed forward because of the national prominence of the columnist – yes, it’s Friedman.) Other reaction has been much more worrisome (in the same NYT issue), or even manic (none of which is to say that the mania in question might not be justified). Still, here at €S we deal (mostly) with the European press, and we like to look for the small but telling new development within the greater picture. I believe we have just that today, from the Belgian (French-speaking) paper La Libre Belgique (and just hold on for a little bit more to appreciate the irony of that daily’s name), with Talking cameras land at Charleroi. Yes, “land” (débarquent), perhaps as if they were some sort of extraterrestrial. 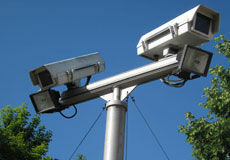 But that’s not as laughable as you may think, for these are indeed security cameras which have had added to them built-in loudspeakers for the watching police to use. Think of that, in light of what the US government (and soon, if not already, our own European governments) know about us and what we do. Just think about that, how far we have come and how far we apparently are going. “Badly-parked cars”; police bawling you out on the sidewalk from out of a security camera. Yes, for now mention is only made of Charleroi, a city in southern Belgium, having this equipment installed. And that will only be at the beginning of next year. But it’s surely coming to us all, and soon, as is surely the landmark case that decides what happens to he who responds to such “peremptorily” being spoken to with nothing more than an upraised middle finger. I have abundant hope that such a case will be triggered early in this whole sad process; but I cannot offer much hope about the conclusion that will be reached. Here’s a serendipitous find from out of today’s wanderings in Die Zeit: Viewers of the new film “Harry Potter and the Half-Blood Prince” could find themselves being viewed at certain movie theaters in Germany. “But it’s dark in there during the show!” you might object. No problem: the one or more people down off to the side of the movie-screen (usually private security firm employees) will be using night-vision devices to keep tabs on the audience. It’s not anything like over-passionate canoodling they’re there to stamp out (or for that matter people talking on mobile telephones in the middle of the showing – damn! ); it’s those who have brought camcorders or similar devices along and are trying to record the film. As you could imagine, it’s films that have just been released to theaters that are particular candidates for this treatment, and Die Zeit further notes that this is by no means a new measure, but has been used at least since back in 2005. This time, though, a powerful coalition of Warner Bros., the Society for Prosecuting Copyright Violations (in German, the GVU), the Federation of German Movie Theaters, and the Union of Film Distributors stand behind it; in response to customer complaints, one movie theater-owner could only plead “If we don’t allow it [the night-vision surveillance], we would never get any more films from Warner.” Nonetheless, officials from the Data Privacy Office of Sachsen-Anhalt (one of the federal German states where this practice has been going on) are now investigating whether Warner Bros., by insisting this way, has violated the law. Was there really a West Berlin – this walled-in, haunted city? Sunk into the past twenty years ago, she is to us today as distant and fantastic as the Moon. Nice, but Büscher’s aim is ultimately not to wax lyrical about his forgotten West Berlin, as we can see from his piece’s simple title: “City of Spies.” Or, if you prefer, Operationsgebiet (“operations area”), West Berlin’s designation in the files of the East German Ministerium für Staatssicherheit, or Stasi, the infamous East German secret police.